GRASS GIS 7 just got better: When reprojecting vector data, now automated vertex densification is applied. This reduces the reprojection error for long lines (or polygon boundaries). The needed improvement has been kindly added in v.proj by Markus Metz. 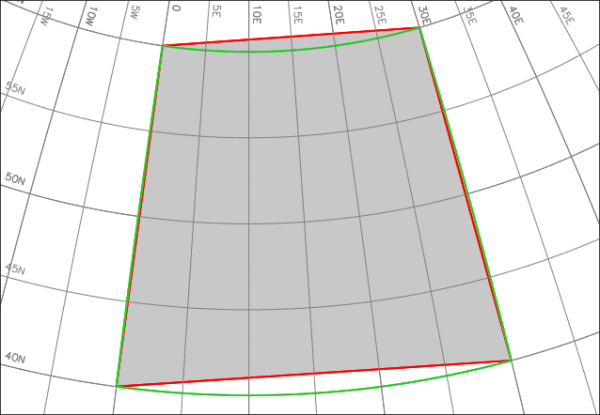 Comparison of the reprojection of a 10 degree large LatLong box to the metric EU LAEA (EPSG 3035): before in red and new in green. The grid is based on WGS84 at 5 degree spacing. The result shows how nicely the projection is now performed in GRASS GIS 7: the red line output is old, the green color line is the new output (its area filling is not shown). Consider to benchmark this with other GIS… the reprojected map should not become a simple trapezoid. Download of box_latlong_10deg.shp for own tests (1kB). The post GRASS GIS 7: Vector data reprojection with automated vertex densification appeared first on GFOSS Blog | GRASS GIS Courses.